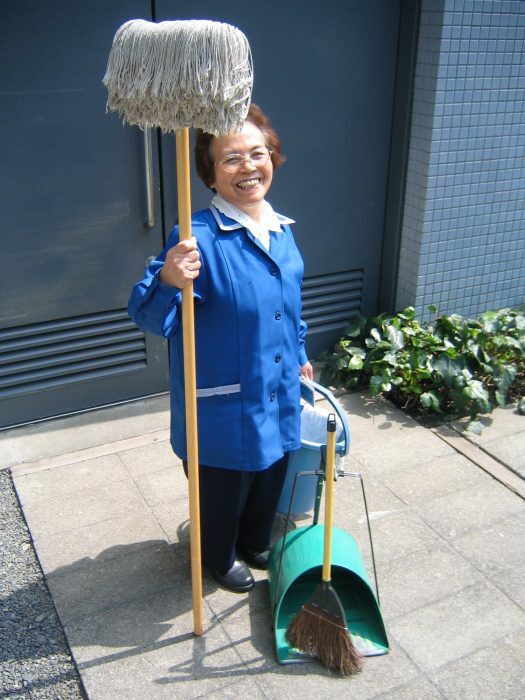 Toshie Kobayashi, 86, worked six days a week for 67 years, from the age of 14 until she turned 81. As a highly skilled typesetter, she made a good living until the 1980s, when digital systems replaced her and analog typesetting machines. At 54, she registered with a cleaning service, and for 27 years she mopped and swept and emptied garbage at department stores, publishers, insurance companies and so on. 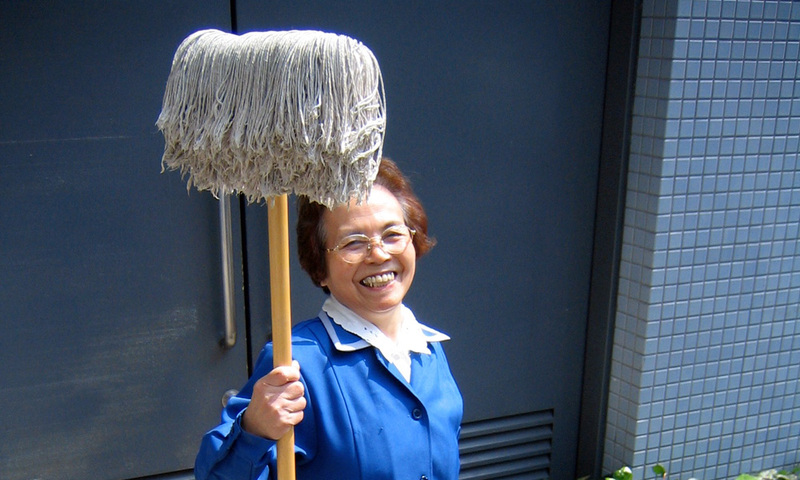 Until her 81st birthday, she worked at a luxury high-rise in Tokyo. She has always been an enthusiastic gourmet and after her retirement she finally has more time to devote to roaming either the department-store food sections or her local konbini, searching for tasty new treats. Life is sweet, she says. There was a time when it was a shame to be single. I always told people that I stayed single because I had to take care of my parents, but that’s not true. I just didn’t want to be a housewife who cooks and stays at home. Suicide kills more than one person. I still miss (the late Hong Kong singer/actor) Leslie Cheung. I saw him in concert twice and I waited for him outside Tokyo International Forum after a show. It was during the winter so it was very cold and he took a long time. My feet were frozen by the time his car finally appeared. I waved and he waved back and smiled at me. Your horizons broaden when you have skills. I was very fast at typesetting and was often headhunted by other printers. I changed companies six or seven times in my 39 years as a typesetter. I also moonlighted, doing difficult jobs such as making phonebooks. I was getting good money and life was swell. The body is faster than the brain. When I stood in front of the metal types, my hand reached out for the characters even before my mind registered which kanji I had to grab. I was like a machine, with my mind racing to catch up with my limbs. So much can be conveyed in a letter. There was a man that I used to work with, side by side, for over 10 years. I was in my 20s and he was in his 40s. He was perfect. What I didn’t have, he had — but he also had a wife so we couldn’t be together. This is the first time I’ve told anyone about this. Every day he would arrange some letters in one of the boxes we would put the text in and he would put it on the floor. I would pick it up and read them. “How are you? I read a nice poem. Here it is.” I would answer by filling the box with my letters. “I like the poem. Thank you.” We barely spoke. Once we did go to see “On the Waterfront,” starring Marlon Brando, but we never touched each other. He bought me books and I gave him rice cakes. When he died, his son invited me to his wake, and his wife asked me to attend his funeral. Sometimes it’s good that the bus doesn’t come on time. Now it is always punctual so it is hard to meet new people. A long time ago we had many bus strikes so people were often kept waiting for the bus. When it didn’t come, we would say, “OK, let’s go get something to eat.” I met many people that way. One day after work, I met two women at the bus stop who also clean in nearby buildings. Since then, on most days we eat lunch together. We talk about work. Talking cleanses our minds. I used to not like Sundays because that was my day off. For the elderly like me, work is our only activity. I must move my body. Otherwise, it gets stiff and painful. So not working really takes a toll on me. I must make a lot of effort to get up and go somewhere. All the good men are on the screen or dead or both. Robert Taylor, Keiji Sada, Gary Cooper, those were gentlemen worth swooning for. I can separate reality from dreams but why should I? Life is more fun when one is dreaming. I never stop. I don’t have many wrinkles because I have the mind of a child. I’ve had a great life as a working woman. I never felt discriminated against or harassed. I worked with men and when they teased me, I took it as a joke and I also made fun of them. I guess it all depends on how you look at things. Victims of certain crimes are also to be blamed. I know I’ve been cheated, but I find it so difficult to get out of scams. Salespeople are so charming and insistent. They say that I only have to pay 1,000 yen for a face massage, but I know it is not true. Still, sometimes they grab my arm and take me into the shop. It’s hard to resist them . . .I also got roped into buying a health drink for 6,800 yen for four bottles, two boxes a month. Whether there’s a building boom or not, the economy must be getting worse. Until 2003, I got paid 1,000 yen an hour, but after that i received 950 yen. I used to work for 4 hours, but after they lowered my hourly wage, my company asked me to finish the same amount of work in 3 hours and 15 minutes so they could save money. Challenges kept me young. I cleaned everything in the lobby, from the toilets to the marble floors, and then I collected all the garbage from every floor, from the 19th to the 2nd. Then I cleaned the back entrance and swept the leaves. And then I had to separate all the plastic from the paper garbage. It was hard to do it all in 4 hours, but I even came up with new ways to work more efficiently so I could do as good a job but faster: in 3 hours and 15 minutes. It wasn’t hard. I worked so I could eat well. I never buy cooked food in supermarkets, only in department stores. I love the small portions, which are perfect for single people like me. I can buy delicacies from famous restaurants from all over Japan and from foreign countries. I might spend 2,000 yen on sweets and 2,000 yen on other things. Takashimaya and Matsuya Ginza are nice. Recently I also became a fan of the konbini ( convenience store) as the food quality & the prices there are unbeatable. Life is great. I am independent, healthy and enjoying life. I have friends and a cozy apartment where I can watch old movies on cable. I am so happy. I hope I can live much longer. A version of this interview appeared in The Japan Times on Tuesday, April 25, 2006.